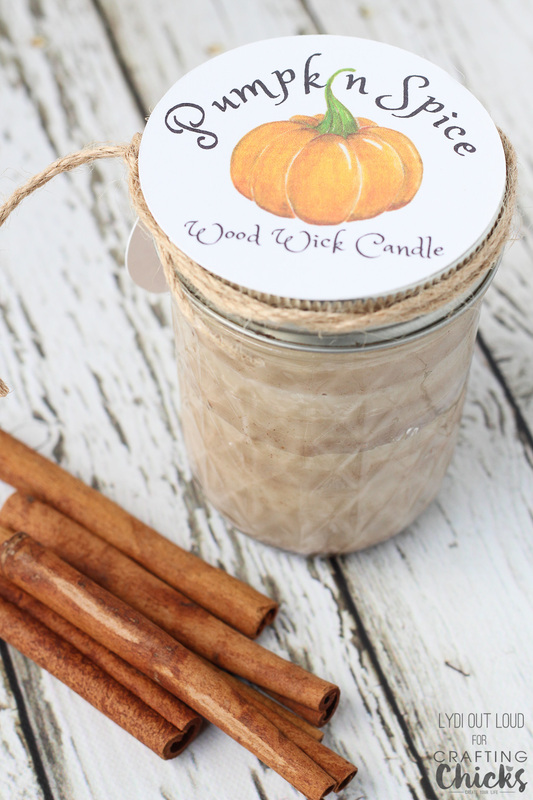 This Pumpkin Spice Soy Candle with a wood wick captures the cozy smells and sounds of fall! 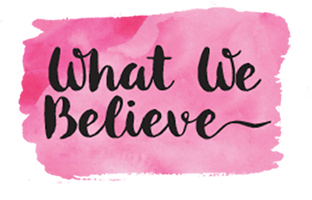 Hi Crafting Chicks friends! Who’s excited for Pumpkin Spice season?! When I get my first whiff of pumpkin spice, it officially feels like fall. Do you think so too? How better to smell pumpkin than with a candle? Making candles is one of my favorite crafts because they fill the house with some an amazing smell and make great gifts as well. I’ve especially loved making candles since I learned how to make my own DIY Wood Wick Candles! 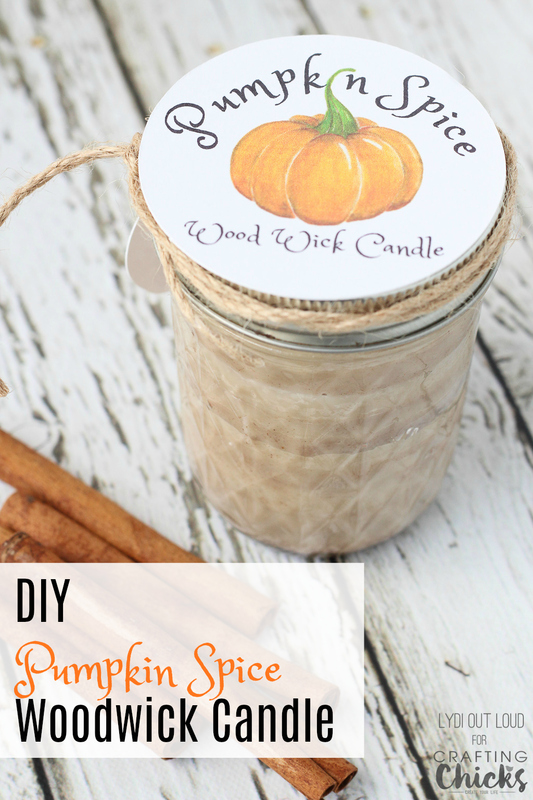 Fill the candle jar you will be using for your pumpkin spice soy candle with soy candle wax flakes and dump into a microwave safe glass bowl. 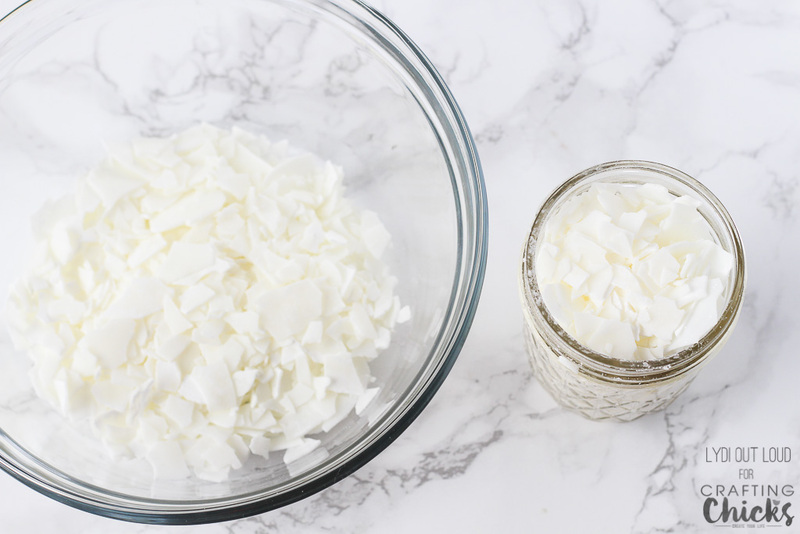 Fill the jar again with more soy candle wax flakes 2 more times and dump into the same bowl. Microwave the flakes in 45 second intervals until melted, stirring well between each interval. NOTE: Use pot holders to to handle the bowl after microwaving as it will be very hot. Mix in essential oils only. Carefully pour the wax into the candle jar. To prevent the wax from ruining your glass bowl, rinse immediately. Place the wood wick into the metal wick holder and place wick into the middle of candle jar. Allow the wax to set for about 5 – 7 minutes and begin to sprinkle in the spices. If the spices immediately drop to the bottom, wait a few more minutes. 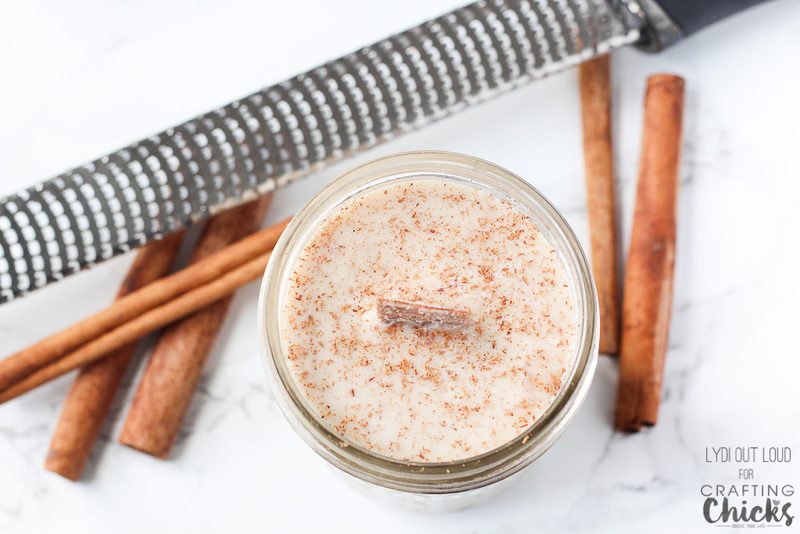 Once you sprinkle in the spices and they slowly drop but are suspended throughout the candle, then you can gradually sprinkle the remainder of the spices into the candle. After the wax sets for about 15 minutes, grate fresh cinnamon on top of the wax with a microplane. 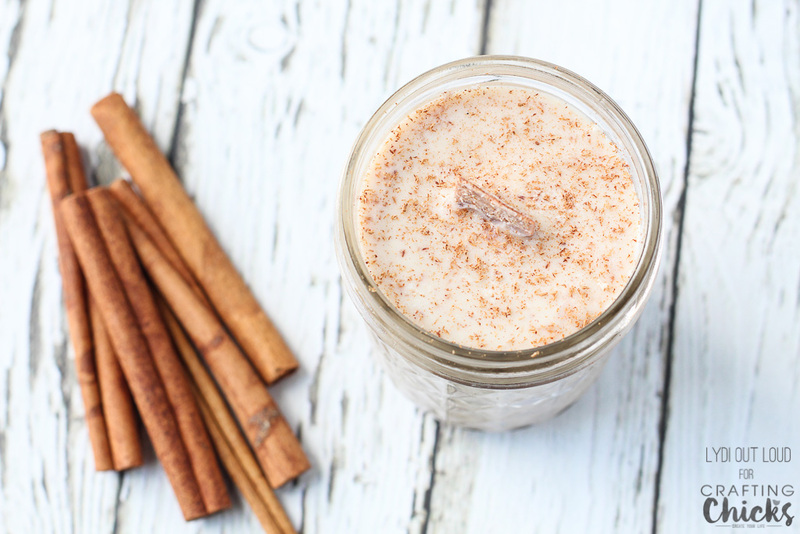 The embedded cinnamon grounds look so pretty in the jar and give a delightful scent as soon as the jar is opened. Allow the wax to fully set (usually about an hour). If necessary, trim the wick to about ½” above the candle. Burn your wood wick candle and enjoy! 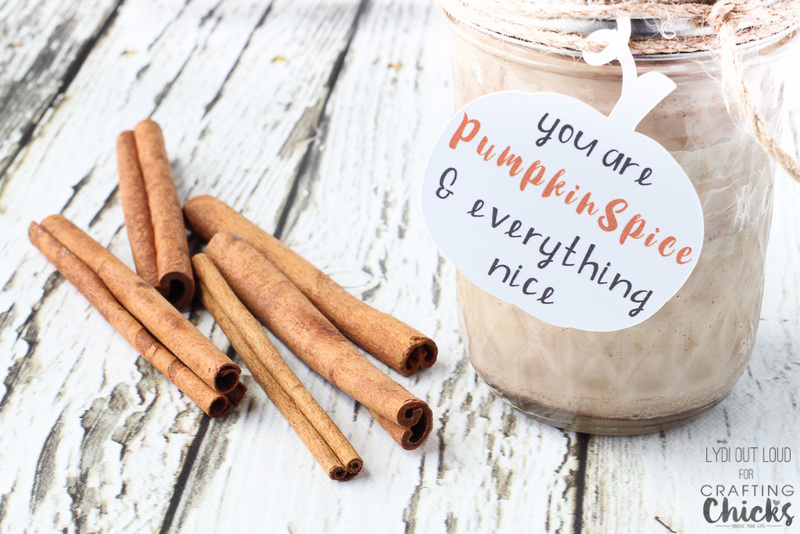 Feel free to use my free printable label and cut out a gift tag with a Cricut machine and you have a wonderful fall gift idea! Love these fall candles Lydia! Where did you find the wood candle wicks? What size jars did you use for these proportions? I’m looking to use the 4 oz size jars. I’ve never made a candle before but definitely going to try this.. thanks!